The Times launched ‘The Times of London Weekly’, its international digital offering, last month. After investigating the app, I loved the idea of it and wanted to try a subscription for a month or two. One problem, I can’t get it in the UK. It’s an interesting quirk of the all-or-nothing subscription model; let’s take a look in more detail. Newspapers and subscription barriers: what works best? Many major newspapers, in an attempt to improve digital revenues, have implemented paywalls of varying severity. I’m as keen as anyone for journalism to become financially sustainable again. But every time I click an interesting link in a tweet and smash up against an inflexible paywall, my heart rather sinks. It’s a prime example of an interface challenge for an imperfect system. And crucially, it stems incoming traffic and good will. 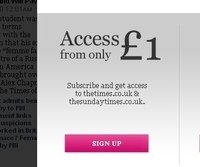 For many newspapers, the decision to erect a paywall has been a decision of last resort. And for a seemingly good reason: despite the obvious need to generate the type of revenue that advertising often can’t provide alone, asking the consumers of your content to pay for the privilege can be a difficult undertaking.